Gordon’s paddle-steamer Bordein at Khartoum. To some the word “gunboat” evokes nostalgic memories of the great days of the British Empire and the military romance associated with it. To others, imbued with the left-liberal dogma of our time, it epitomizes the evils of imperialism and the imposition of the will of the powerful upon the weak. Here, however, we are not concerned with the politics of the gunboat but with its use on a particular river at a particular period of history, namely on the Nile from 1884 to 1899. The story of General Gordon, the failed attempt to rescue him and the Fall of Khartoum to the Mahdi is probably not as well known today as once it was before “inappropriate” Henty-style dramas were eliminated from the public educational curriculum, so some readers may wish to be reminded of the background. Since the 1820s, the inhabitants of the Sudan – a collection of tribes rather than a nation had groaned under the yoke of Turco-Egyptian misrule and exploitation when, in 1883, there appeared one of those messianic figures who emerge from time to time in the Muslim world, the Mahdi Mohamed Ahmed. A man of great holiness, receiving his instructions from Allah via the Prophet Mohamed, he succeeded in unifying most of the northern Sudanese tribes in a jihad against Egyptian rule, and by late 1884 had surrounded the last major Egyptian garrison in the capital, Khartoum. The British, who had recently occupied Egypt, regarded this state of affairs with misgiving as the Nile waters that flow through the Sudan are vital to Egypt’s economy – indeed, to her very existence. Earlier, in 1883, they had sanctioned, and tacitly encouraged, an Egyptian expedition to the Mahdi’s stronghold in western Sudan under a motley selection of British and European mercenary officers lead by General Hicks, formerly of the Indian Army. This had ended in disaster with Hicks’s thirst-ridden and disorganised rabble being completely destroyed by the Mahdist ansar at the Battle of Shekan in November of that year. Still unwilling to put British boots on the ground, the Gladstone government hit upon the idea of sending one man, General Charles Gordon, to evacuate the garrison and foreign civilians from Khartoum. Gordon, a fearless but totally unbiddable religious eccentric, had ideas of his own and decided to tough it out, believing that Gladstone would be forced by public opinion to send a relief expedition. In this, he was right, but unfortunately the expedition, under General Wolseley, both started and arrived too late, and it is at this point that we can bring the gunboats into the story. Gordon had several of these – they were in fact armed paddle-steamers rather than true gunboats (see the lists of vessels on pages 9 and 10) – at Khartoum, and in December 1884 he sent them downstream to meet the approaching relief expedition at Metemma. The Desert Column, as it was known, now under Colonel Sir Charles Wilson, had fought several desperate actions, had lost its commander, was encumbered by large numbers of wounded, had no craft of its own (the River Column had not arrived) and was short of camel transport. However, with the arrival of Gordon’s steamers, Wilson was able to make a last-minute attempt to relieve the capital or, at least, to remove Gordon – although it is by no means certain that Gordon was willing to be removed. The steamers selected for the dash to Khartoum were the Bordein and the Telahawiya (also known as the Tel el Hoween) commanded by two Shaigi (a Sudanese tribe opposed to the Mahdi) officers, Khasm el Mus and Abdel Hamid. Wilson himself, together with Captain Gascoigne of the Blues, ten men of 1st Battalion Royal Sussex and one hundred and ten Sudanese soldiers who had come down from Khartoum in the steamers, were in the Bordein. Also on board were Wilson’s batman, Sutton, an interpreter and another prominent Shaigi, Mohamed Bey Ahmed, as well as “a great religious sheikh from Kassala” (Wilson’s words). In the Telahawiya were Captain Lionel Trafford and another ten Royal Sussex men, Lieutenant the Hon E J Montagu-Stuart-Wortley of the 60th Rifles, an officer who seldom allowed himself to be excluded from any exciting military adventure, his batman, a Royal Naval artificer, a signaller and eighty more Sudanese soldiers. Spread between the two “penny-steamers”, as Wilson described them, was a band of bashi-bazouks, a kind of militia used throughout the Ottoman Empire as tax collectors and general bully-boys, in this case apparently a mixture of Moroccans, Kurds and Albanians, while a nuggar or barge towed behind the Telahawiya contained another fifty Sudanese soldiers, their wives and children and a supply of durra (sorghum), the staple diet of the Sudan. The crews of both steamers were made up of Egyptians, Sudanese and a few Greeks. Faced with command of such a polyglot crowd and such a task, it was a miracle that Wilson managed to get underway on 24 January 1885 ; indeed, it is remarkable that these funny little vessels did not sink under the sheer weight of the people, equipment and stores on board. No medical officers or even orderlies were taken, but a herd of milking goats was, adding to the stench which rose from the holds of the steamers where the wives and slave-girls of the native soldiers cooked durra-cakes and suckled their babies. From these foetid depths emerged large numbers of rats and other vermin which kept Wilson awake at night by scuttling over his balding pate. The only fuel available for the steamers’ boilers were the sakiehs (water-wheels) along the banks and parties were landed from time to time to break these up and bring them on board. The British officers and Sussex men had great difficulty in concentrating the minds of their Sudanese allies and bashi-bazouks on this task and in preventing them from looting and feasting on any edible beast so unfortunate to cross their path. Reaching the Sixth Cataract, which included the exceptionally hazardous but fortunately undefended Shabluka Gorge, on the 25th , Bordein struck a rock from which, by great exertions, she was dislodged, eventually reaching open water. On the morning of the 28th, Khartoum was sighted and the rescue mission soon came under heavy fire from the village of Halfieh, and a little later from Tuti Island. At first they thought that the city was still holding out, as the fire from Tuti Island appeared to be aimed at Khartoum opposite. The steamers’ 9-pounder cannons went into action and the Sussex men opened up with their Martini-Henrys, and the Sudanese troops with their Remingtons. Soon the little ships were being bombarded from all directions, but Mahdist marksmanship and gunnery was poor and there were few casualties and little damage. Then it began to dawn upon Wilson and his companions that no shot was being fired to assist them. With sinking hearts and straining eyes, they searched through their binoculars for the Egyptian flag, which they knew should be fluttering over Gordon’s palace. It was not. The siege was over. Khartoum had fallen. But what of Gordon? Wilson had an agonising but clear decision to take. To try to land his tiny force in the face of such odds in the hope that Gordon might still be alive and holding out somewhere would be suicidal. The chances of getting back to Metemma were slim enough and the longer they delayed the slimmer the chances became. He must go about and run downstream as fast as his steamers could carry him with his demoralised force. An additional worry was that, with the fall of Khartoum and the evident triumph of the Mahdi, the loyalty of the steamers’ captains, crews and the Sudanese troops could no longer be taken for granted, and special vigilance was required on the part of the small British contingent. By four o’clock they were out of range of the Mahdist guns and the British officers turned their hands to patching up the few wounded. Surprisingly, the injuries were minor and none of the Sussex had been hit. The most dangerous moments had been when a burning shell-fuse had landed on the deck of Telahawiya, but this had been thrown overboard by Drummer Gilbert. Similarly, a blazing fragment of wood had fallen among the ammunition boxes on Bordein but was disposed of by a Sudanese soldier. Next day, however, their luck changed when Telahawiya struck a rock and sank, leaving just enough time for her personnel and most of her stores to be transferred to Bordein. Such disasters often come in pairs and, on 31 January, Bordein, too, was severely holed by a rock and started to sink. The crew managed to lay her on a sandbank adjacent to the island of Mernat. Now steamer less, Wilson was faced with the bleak alternative of staying on the island until help could reach him or attempting to march the remaining forty or so miles to Metemma through hostile country. His mind was made up for him when the native troops flatly refused to move, so, bowing to the inevitable, he prepared defensive positions on the island and dispatched the intrepid Stuart-Wortley in a rowing boat with four British soldiers and eight natives to Metemma for help. Starting at dusk, the boat slid past an enemy battery at Wad Habeshi just as the moon rose and the gunners on the bank could be heard discussing whether or not it was a boat they could see. “Wortles”, as he was known to his friends, held his breath and, as a little bit of insurance, held a pistol to the head of the native helmsman to discourage any thoughts of betrayal. His dawn arrival at base caused the immediate preparation of another steamer, the Safiya, to start upstream to rescue the would-be rescuers. Commanded by Captain Lord Charles Beresford of the Naval Machine-Gun Section and crewed by some of his sailors, Safiya sailed at 2 p.m. on 1 February with about twenty British soldiers under Lieutenant Bower on board. Needless to say, Wortles was not left behind. It took Safiya about four times as long against the current as Wortles had taken going with it, and it was not until late on 3 February that her approach was spotted by Wilson’s lookouts. Remarkably, the stranded force had escaped attack, owing partly to their being on an island and partly to the hesitancy of the enemy, perhaps caused by the Sussex men wearing red jerseys, such was the fearsome reputation of the British “Red Coat” in the Victorian era. However, Safiya herself came under heavy fire, was hit in the boiler and had to defend herself vigorously while Chief Engineer Benbow carried out emergency repairs. Eventually, embarking his entire force on the heavily laden Safiya, Wilson managed to reach Metemma on the evening of 4 February, having abandoned Bordein, which fell into the hands of the Mahdists. By any standards, apart apparently from Wolseley’s, this had been a remarkable feat. However, when in due course he reported to his chief, his reception was chilly. Wilson was to be made the scapegoat for the failure to relieve Gordon, although the lack of political will on the part of Gladstone’s government and Wolseley’s lethargic performance from the beginning of the expedition, were far more blameworthy. In the event, neither man was ever given another active command. Even further down the scale of command there was, unusually for a Victorian campaign, no liberal distribution of decorations, although four of the Sussex men deservedly received the Distinguished Conduct Medal. Within six months of taking Khartoum and assuming control over most of the northern or “Arab” Sudan, the Mahdi had died, probably of typhus, and the leadership devolved upon his right-hand man, the Khalifa Abdullahi el-Taishi, who remained in power for the next thirteen years. During this time, the Anglo- Egyptian authorities retained control over the Sudan’s only port, Suakin, thus largely isolating the country from the rest of the world, as to the north lay Egypt, and to the south vast areas of bush and swamp inhabited by non-Muslim tribes hostile to the government in Khartoum. 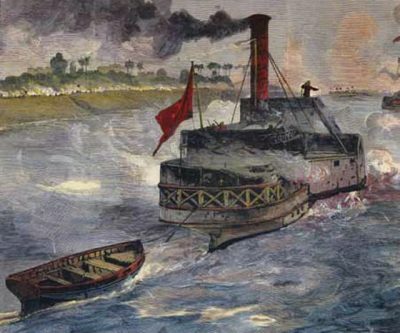 The armed steamers Bordein and Safiya, abandoned by the British on their withdrawal in 1885, were used to launch forays against these tribes but although slaves and ivory were seized, little governmental control could be exercised. To the east lay the Christian empire of Abyssinia, against which the Khalifa waged desultory but bloody warfare, achieving little but expending thousands of lives, as did his hopelessly ambitious attempt to invade Egypt in 1889. Besides this, famine and the massacre of tribes that opposed the Khalifa may have reduced the population of the Sudan by as much as two-thirds during the period of the Mahdiya. Nevertheless, the Khalifa managed to maintain an army of at least 60,000 men, many of whom retained a fanatical loyalty to the ideals of Mahdiism to the end. There no longer being any threat to Egypt from the Sudan, the British Government was content to allow this state of affairs to continue almost indefinitely, while the Khedive of Egypt had little choice but to accept any policy adopted by the British. However, in 1896 certain aspects of European politics and diplomacy, principally the threat from France to fill the power vacuum on the upper Nile as well as pressure from Italy – whose Eritrean colony was under threat from the Khalifa – caused Lord Salisbury’s Government to order the re-occupation of Dongola, the Sudan’s northernmost province, as a preliminary to the re-conquest of the whole country. Thus, in March 1896, most of the Egyptian Army, under its Sirdar (Commander-in-Chief) General Kitchener, crossed the border into the Sudan, supported by a British infantry battalion (North Staffords) and a flotilla of four gunboats. The Khalifa was no strategist, and having been persuaded by a prophesy that the infidel army would be destroyed in a great battle on the plains of Kerreri near his capital Omdurman, his resistance to the invasion in its early stages was half-hearted. In any case Dongola was a very long way away. In the event it would indeed be two and a half years before Kitchener’s army reached Omdurman, where, true to the prophesy, a great battle would be fought on the plains of Kerreri – but with the opposite outcome to that foretold. The first significant action of the campaign was fought on 7 June 1896 at a village called Firket, where Mahdist resistance was easily overcome. An outbreak of cholera, which claimed many lives, delayed operations throughout July and August. However, on 18 September, the gunboats Tamai, Abu Klea and Metemma came into action for the first time. Spotting a fleet of Mahdist gyassas (cargo sailing boats) moored to the bank, they opened up with salvos from their Krupp and Maxim- Nordenfelf guns, accompanied by long bursts from their Maxim machine-guns. However, on reaching the narrows opposite the village of Hafir, they themselves came under heavy and unusually accurate fire. On the flotilla leader’s vessel, the Tamai, the “admiral” himself, Commander the Hon S.C.G. Colville, RN, was wounded in the wrist, and one of the machine-gunners, Sergeant Richardson, was killed. Rather ignominiously Tamai turned about and scurried away downstream to report the situation to the Sirdar. But the General’s instructions must have been uncompromising, since Tamai soon steamed back to join her sister ships in the thick of the fight, from which, at one point, Metemma (Captain Oldfield, RM) was also forced to withdraw. The Mahdists may have won this duel on points as, after about two and a half hours, the Sirdar ordered his gunboats to steam on past Hafir to Dongola without silencing the enemy’s guns, bringing his artillery into action to cover their progress. However, with two senior emirs wounded and about a hundred men killed, the Mahdists slipped away from Hafir in the night, leaving the way open for the invaders to complete their advance on Dongola which, after bombardment by the gunboats, proved to be undefended. Thus was completed Phase One of the reconquest of the Sudan. For nearly a year, while the construction of a railway line progressed across the Nubian Desert from Wadi Halfa to join the Nile at Abu Hamed, large-scale military operations came to a halt. The gunboats, soon increased in number to seven with the addition of three “large” stern wheelers Zafir, Nasr and Fateh (see Appendix), were employed principally in escorting cargo vessels, towing barges and keeping the river banks clear of the enemy. In August 1897, Abu Hamed was taken after a sharp action in which two British officers were killed, and soon after that Berber was occupied. Large numbers of local people were pressed into gangs to drag the gunboats and other vessels over the cataracts, but El Tab (later renamed Hafir) was wrecked and her commander, Lieutenant (late Admiral of the Fleet the Earl) Beatty and his crew were lucky to escape with their lives in the raging waters, but by the end of August five gunboats had arrived at Abu Hamed. In mid-October, Zafir, Fateh and Nasr under Commander Keppel reached Shendi, the headquarters of a large force under the Khalifa’s cousin the Emir Mahmud, and for a couple of days rained shot, shell and Maxim fire on his fortifications. However, it was felt that, before any further advance could be made, British troops should be brought forward to stiffen the Egyptian Army, and, in February 1898, a brigade consisting of the Warwicks, Lincolns, Camerons and Seaforths, with an artillery battery, arrived from Cairo. With the arrival of these reinforcements, the advance continued and a major action, known as the Battle of the Atbara, took place on Good Friday 8 April 1898, when the Anglo-Egyptians attacked the zariba (defensive position) of the Emir Mahmud at Nakeila. The Atbara River being too shallow at that time of year to permit the participation of the gunboats, several of their officers and NCOs were temporarily transferred to duties on land, including Lt Beatty, who commanded a rocket battery, and a number of Royal Marine machine gunners, several whom were awarded the DCM. 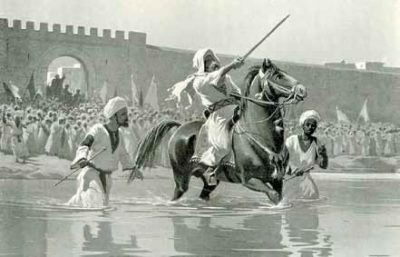 Although Mahmud had been joined by the forces of another leading emir, Osman Digna, his army was completely overwhelmed in the battle, and he himself was taken prisoner (Osman Digna, a wily old fox, escaped). There were now no substantial Mahdist forces between Kitchener’s army and Omdurman but the final advance took several months to prepare. During the summer the gunboat flotilla was considerably strengthened by the arrival from England of three brand-new twin screw vessels, Melik, Sultan and Sheikh which were shipped in sections and assembled on the Nile at Abadiya. Also brought to the front were a further British infantry brigade (Grenadier Guards, Rifle Brigade, Northumberland and Lancashire Fusiliers), a cavalry regiment (21st Lancers) and a second artillery battery, which increased the total strength of the Anglo-Egyptian army to approximately 25,000 men and ten gunboats. The final and bloodiest battle of the campaign took place on 2 September 1898, as predicted on the plain of Kerreri, and became known as the Battle of Omdurman. The Khalifa’s army of about 55,000 men suffered over 11,000 killed and unknown numbers of wounded, as compared to trifling Anglo-Egyptian casualties of a few dozen killed and wounded – most of these being sustained in the famous and, it must be said, foolhardy charge of the 21st Lancers, in which Winston Churchill took part. The gunboats had played a considerable role bombarding Omdurman, including, controversially, the Mahdi’s tomb, and, in the case of Melik, rescuing the Egyptian cavalry and Camel Corps, which had been surprised by a large Mahdist “Flag” (division) and forced to retreat helter-skelter to the river, where they came under the protection of her considerable firepower. The night before the battle, the searchlights on the gunboats had dazzled and bewildered the Mahdists, who may have been contemplating a night attack, which would have considerably diminished the invaders’ advantage in weaponry and technology. The Khalifa himself managed to escape from Omdurman and for over a year wandered the wilds of Kordofan with the remnants of his army until they were finally brought to bay and killed at the Battle of Um Dibaykarat in November 1899 by an Egyptian Army force under Colonel Wingate, whose report tells us that the Khalifa and most of his remaining emirs met their deaths with courage and dignity. Two days after the Battle of Omdurman a memorial service to General Gordon was held in the ruins of his palace at Khartoum, and Melik fired a salute in his honour. Thereafter the gunboats were fully occupied in mopping up operations on the White and Blue Niles. Sultan, Fateh and Nas were involved in the Fashoda Incident, a confrontation between Britain and France on the Upper Nile, which could have led to war, had it not been for the good sense and diplomatic skills of the officers on the ground of both nationalities. Over the past century or so most of the gunboats and armed steamers, like old soldiers, have faded away but there are two notable survivors, Bordein and Melik, both of which, it is hoped, will now be preserved for posterity through the good offices of various organisations, public and private, in the Sudan and Britain, where this is the central aim of the Melik Society. BORDEIN. Length 140 ft. Beam 12ft. Draught 3 ½ ft. 40 HP engine by Penn. Built by Samuda Bros of Poplar in 1864 and assembled at Boulak near Cairo. Armament: two 9pdr Canon Rayes (rifled). Used by Hicks and Gordon and by Wilson in Gordon Relief Expedition when wrecked at Mernat Island. In Terence Cuneo’s famous painting “The Last Dispatch”, her deck is protected by a kind of wooden palisade. Salvaged by the Mahdists, she was recaptured after the Battle of Omdurman and used for transport until 1905, then laid up in Khartoum North dockyard. Neglected for many years, she has now been transported to a heritage site in Omdurman where she is undergoing reconstruction for preservation on land. TELAHAWIYA (or Tel el Hoween). Length 160ft. Beam 14 ft. Draught 3 ½ ft. Engine 40/60 HP by Penn. Built by Samuda Bros of Poplar 1860s. Armament two 9pdr Canon Rayes. Wrecked in Gordon Relief Expedition and never salvaged Safiya . Specifications as for Bordein. Captured by Mahdists 1885 and recaptured after Battle of Omdurman. Used for transport until 1905. Last seen in 1912. ZAFIR, NASR and FATTEH (known as large stern-wheelers). Built in the 1890s for the Dongola (1896) campaign but, arriving too late to take part in the campaign, were assembled above the Second Cataract early in 1897. Drew about 2ft 9ins of water. Armament: two 12pdr QF guns, two 6pdr QF guns and three .45 Maxim MGs. TAMAI, METEMMEH and HAFIR (known as small stern wheelers). Built in the 1880s. Length 90ft. Draught 2ft 6ins. Armament: one 90mm Krupp gun and two .45 Nordenfelt MGs. Later, Maxims were brought on board as well. MELIK, SHEIKH and SULTAN (known as twin-screw gunboats). Melik was built by Thorneycroft at Chiswick; Sheikh and Sultan by Yarrow at Poplar on the Isle of Dogs. Shipped out in sections and assembled on the Nile at Abadiya in summer 1898. Length 145ft. Draught 2ft. Beam 24ft 6ins. Two twin cylinder compound steam engines. Armament: two 12pdr QF guns, one 4in howitzer and four Maxim MGs. In 1926 Melik became the clubhouse of the Blue Nile Sailing Club and remained as such for about sixty years (apart from being temporarily recommissioned during WW2), until she was swept up onto the river bank by an exceptionally high flood. Now she lies in a sand berth on the premises of the club awaiting restoration. In 1939 she featured in the film version of The Four Feathers. The crews of all the gunboats were a mixture of Royal Navy and army officers, Royal Marine NCOs, Royal Navy Petty Officers, civilian engineers of various nationalities and Egyptian and Sudanese crewmen. Among the officers on board Zafir was no less a personage than Brevet Major His Highness Prince Christian Victor of Schleswig-Holstein, a grandson of Queen Victoria.